Microsoft thinks 2 MB of RAM is standard these days! This image, taken from the new Windows Laptop Scout, which is really awesome by the way, really shocked me! Either this is a very grave mistake on behalf of the web masters at Microsoft, or Microsoft has published the requirements for the Windows 3.1 era. I believe it’s the former, but still shocking none the less! I have to admit, the 3rd and 4th choices are way to similar. Or maybe they just made another mistake ( I’m looking at you, Microsoft webmasters! ). Or Home Entertainment is different from Music, Movies and More, where ‘More’ should be pictures and TV, I guess. 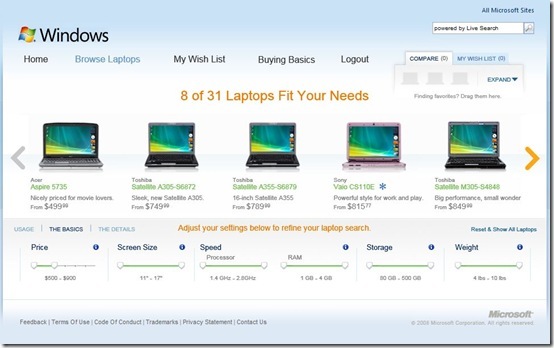 The browse laptops has a slick slider system which makes it very easy to find the laptop that fits your choice. Using it you can change the dimensions, budget and weight as the criteria for laptops shown as well brands, graphics and video capabilities, processors and style. 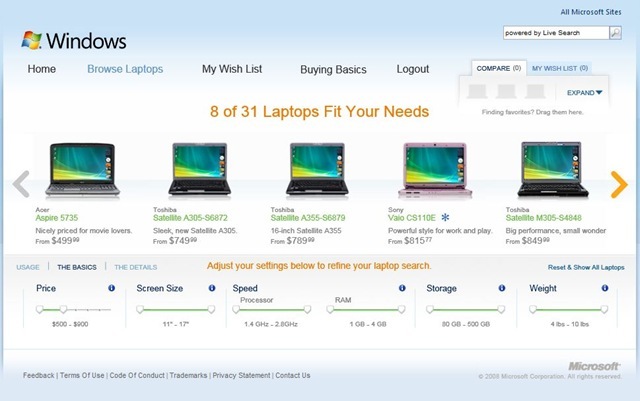 I think they should add a Windows 7 capable option as well for those seeking a future proof laptop. The compare feature also nails it very well. And, every laptop runs Windows Vista too! 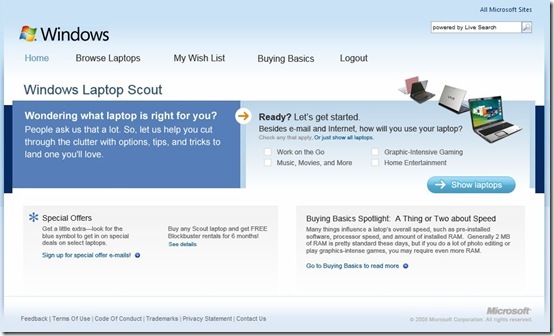 Also, if you are a ‘n00b’ you can read their buying basics guide to get started. 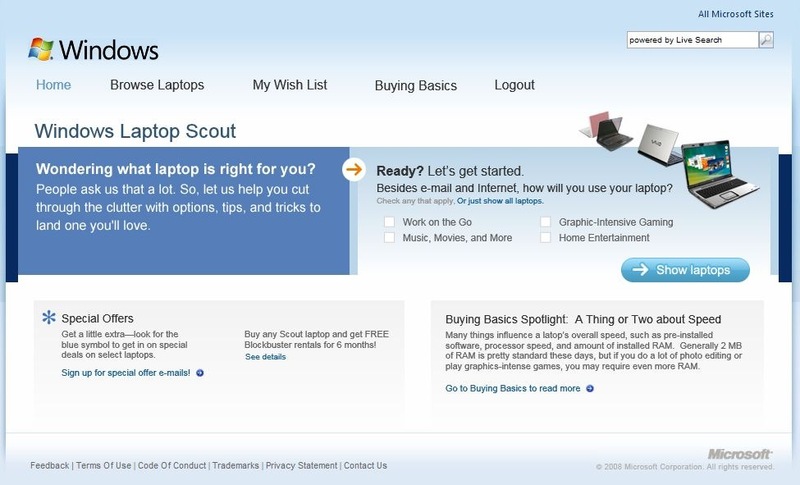 An added benefit is that you can buy any scout laptop and get 6 months of free Blockbuster rentals. A very helpful website by Microsoft, but I’m not sure why this isn’t just a part of the Microsoft Online Store. But still a great place to get started or search for your next portable companion. 2 MB…?! ROFL! If that’s standard RAM, then I own a super computer LOL! As Jesse states above, these laptops are not being sold at the Microsoft Store because they aren’t Microsoft products. It wouldn’t make sense to sell them there. I understand what you guys are saying, but like even advertising this website on the Microsoft Online Store would be a bit helpful for customers as of course they need good hardware to run Windows on.